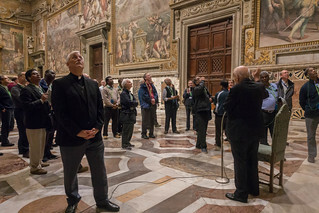 Almost all the delegates to the General Congregation and many members of the supporting teams left the General Curia to travel to the Vatican Museums, a twenty minute walk. 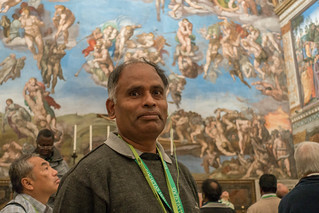 Father Adolfo Nicolás was among them for his last night in Rome before leaving for a new mission of his Jesuit life. 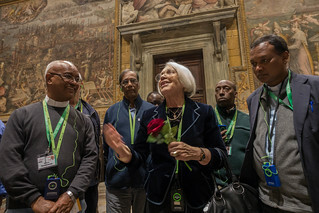 For two and a half hours, the delegates enjoyed a visit organized especially for them, outside of business hours. 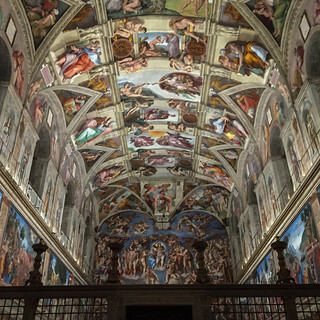 With treasures from different parts of the world, the Vatican Museums are considered the largest after the Louvre in Paris. First, some praise for the excellent logistics of the organization. 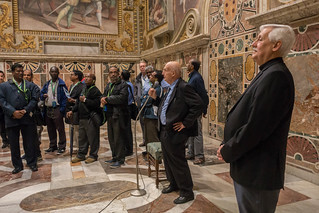 Our large crowd was divided into a dozen groups of 20 to 25 people, each led by a professional tour guide offered by the institution. One could choose to participate in a group in English or Spanish. A sophisticated Wi-Fi system allowed each group to hear, with an earpiece, its own guide on a specific frequency. In addition, the groups did not follow the same route to avoid congestion. A successful planning! 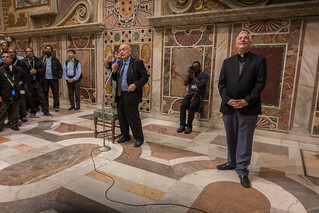 The museum director, Antonio Paolucci, with Father General at his side, welcomed the Jesuits and said he was honoured to provide an opportunity for them to enjoy a cultural moment in a place where art meets history and Catholicism. 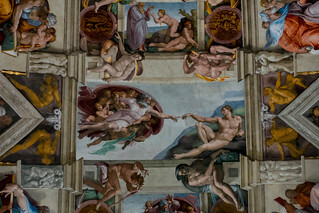 This introductory gathering was held in the hall between the Pauline Chapel and the Sistine Chapel. 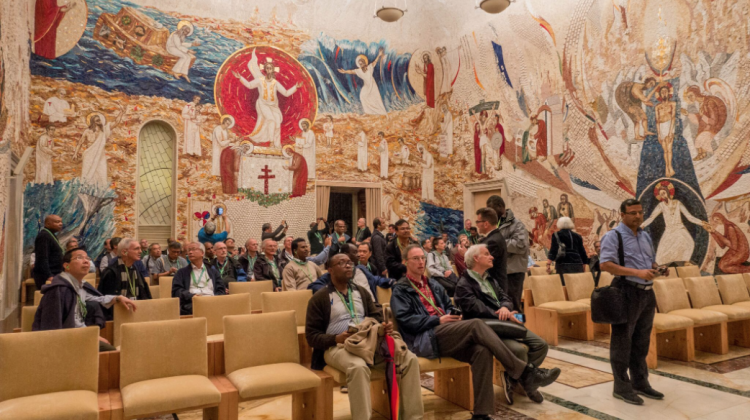 It is in this room that the cardinals, during a conclave and before entering the Sistine Chapel for the vote, share information informally; one could almost see it as the hall of murmuratio! 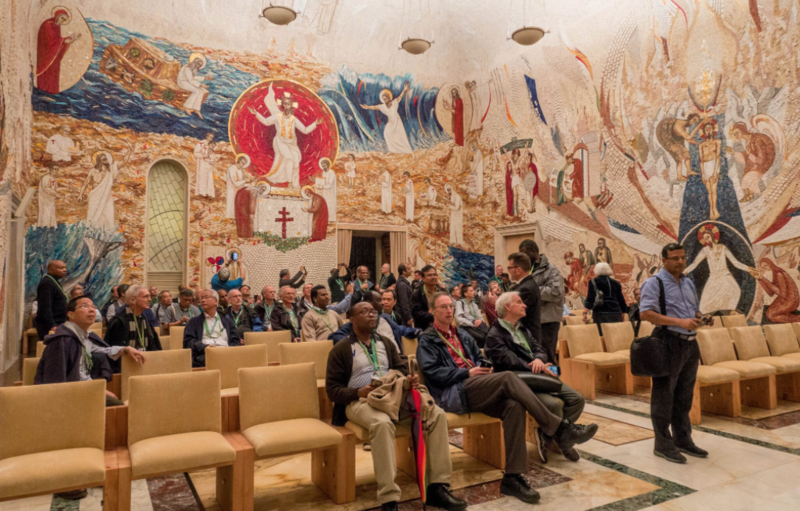 The frescoes around us stressed primarily the Renaissance Church’s desire to for recognition as a political power. It is a context that seems far from the mind of Pope Francis, but it is a part of history that we need to know and to face. Each group then left with its guide. 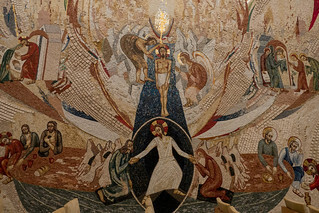 Because of the Jesuit character of the visitors, the Redemptoris Mater chapel, decorated by the Jesuit artist Marko Rupnik and his team at the Centro Aletti, was accessible: the visitors discovered the rich illustration of the history of Redemption, through the giant mosaics. 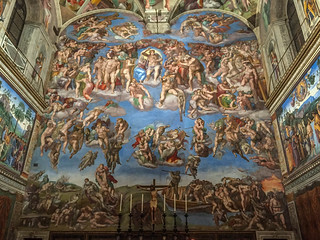 The two chapels, the Pauline and Sistine, where several famous artists practised their art – particularly Michelangelo – captured the attention of all groups. 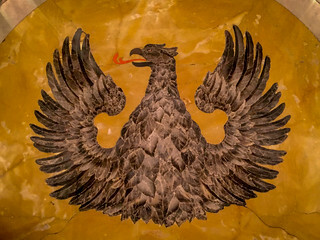 We must emphasize the quality of the guides who talked about arts and artists, but we also able to set what we could admire in its historical context and in connection with the different symbolic and spiritual currents evoked.